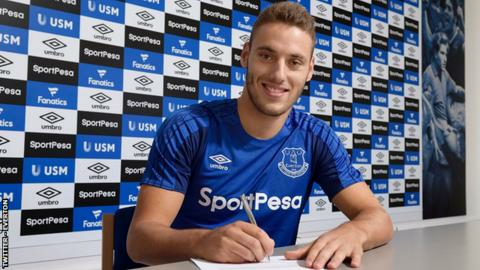 Everton have completed a deal to sign Hajduk Split's teenage forward Nikola Vlasic for a fee believed to be £10m. The 19-year-old was granted leave from Croatia's Under-21s to discuss a move to Goodison Park before Thursday's 23:00 BST deadline. Vlasic impressed Everton manager Ronald Koeman and director of football Steve Walsh in the Toffees' recent Europa League qualifying tie with Hajduk. Koeman wanted to sign a high-profile striker and left-sided defender. Vlasic said: "The Premier League is the best league in the world and this is one of the top clubs in England. It is such a big honour for me to be here. "When I heard that Everton were interested in me, I knew straight away I wanted to come here." Koeman added: "He is one of the big young talents in Europe. "He is one of those players who can play a big part in Everton's future and in what we want to achieve as a club. I think we can do great things together." Everton have enjoyed a productive transfer window, completing a club record £45m deal for Swansea's Gylfi Sigurdsson, re-signing Wayne Rooney from Manchester United and spending a potential £30m each on centre-back Michael Keane and goalkeeper Jordan Pickford. They have also signed midfielder Davy Klaassen for £23.6m and striker Sandro Ramirez for £5.2m. However, striker Romelu Lukaku joined Manchester United for £75m and Koeman has indicated that he expects Ross Barkley to leave the club.